PEAKS X introduces a feature-based identification method to its unique de novo assisted workflow to increase sensitivity and maximize peptide identification efficiency for in-depth shotgun analysis of complex proteomes. The innovative approach is able to push the limits of discovery to capitalize on mass accuracy and resolution advancements of current mass spectrometry instrumentation. Take advantage of industry leading MS technology and overcome the peak of the unknown with PEAKS comprehensive solution for discovery proteomics. 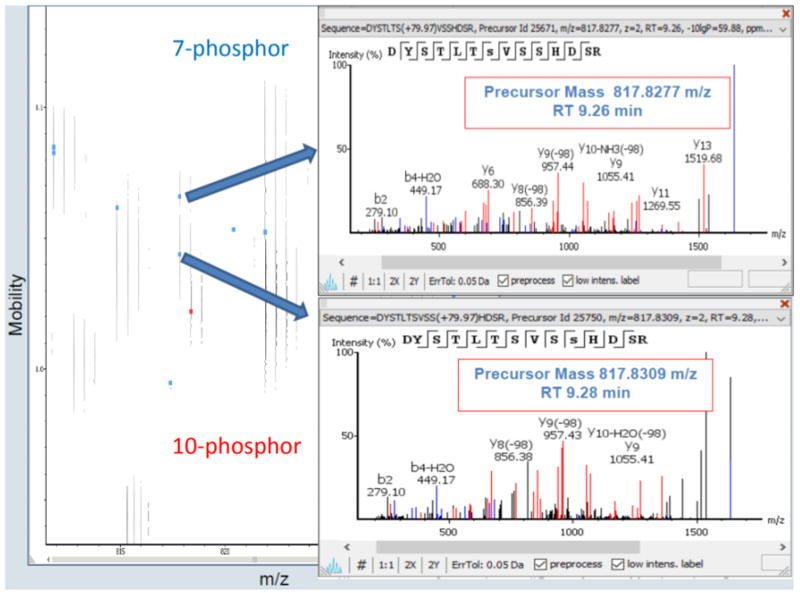 Today’s mass spectrometry data is acquired with higher resolution and mass accuracy and this can be exploited by increasing sensitivity of data analysis. 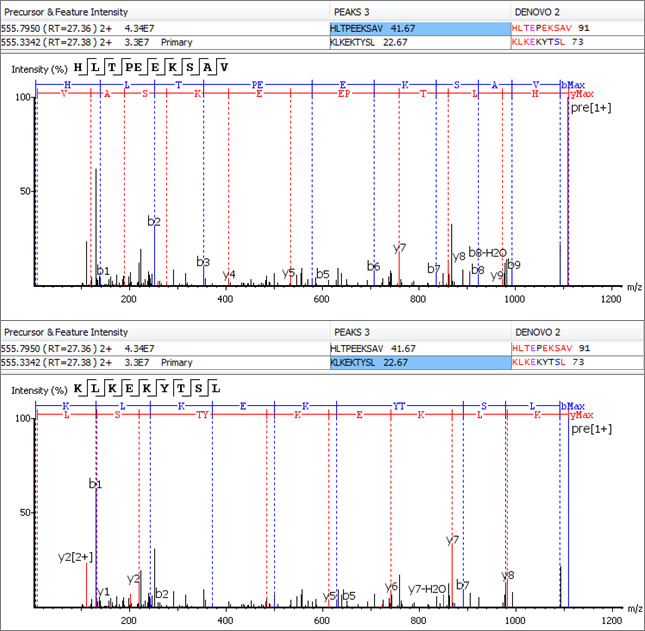 Challenge the DDA paradigm of “one MS/MS spectrum = one peptide” with PEAKS’ MS1 feature-based approach to increase efficiency of peptide identification and enable correct inference of co-eluted isobaric peptides. Both DDA and DIA technologies are rapidly advancing, and researchers need an analysis method that harmonizes the benefits of both acquisition methods. In recent years, DIA has become increasingly popular due to its parallel nature of acquiring all fragment ions for all precursors within a selected m/z range. This overcomes the limitations of sequential MS/MS acquisition in DDA. As a vendor neutral proteomics software developer, we strive to provide a comprehensive solution to facilitate proteomics research and support efficiency in mass spec labs. Avoid the need to use different software for various analytical and acquisition methods. PEAKS X’s new feature-based identification approach enables full DIA analysis support without the need of a spectral library. Acquired signals from DIA scans are analyzed directly to determine the peptide sequence and allow researchers to discover beyond the spectral library. With the combined de-novo and feature-based technique, we set to remove biases found in commonly utilized approaches. With endogenous peptides, there are inherent challenges with the abundance and natural complexity that pose analytical road blocks. 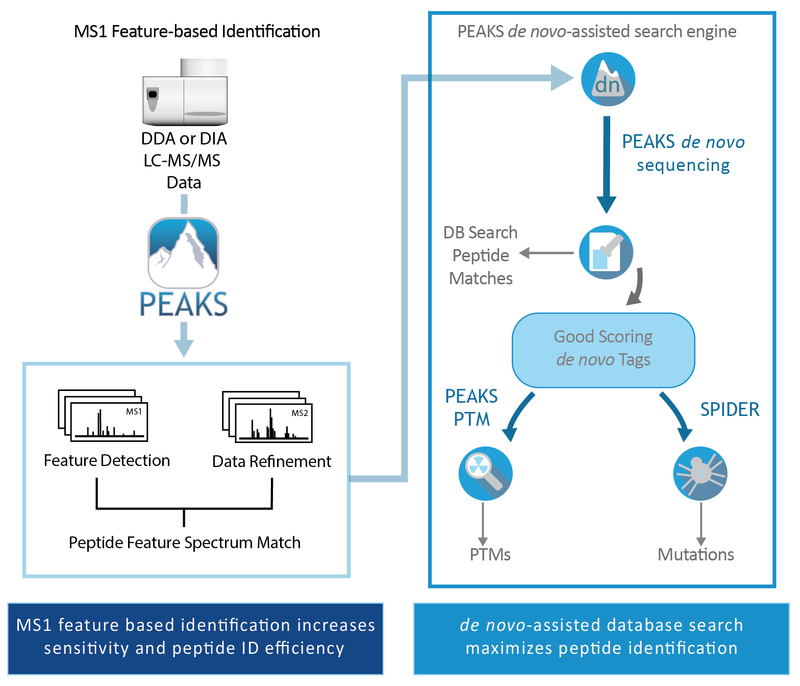 PEAKS X combined with the latest MS technologies improve peptide identification efficiency and resolve pain points, like integrating de novo sequencing into database search, non-enzymatic peptide sequencing, and resolving co-eluted peptides. Ion Mobility Spectrometry – Mass Spectrometry (IMS-MS) provides a compelling analytical workflow for complex biological and chemical mixtures by adding an additional dimension of ion separation; a 4th-dimension. With IMS-MS, ions are separated based on their mobility through a buffer gas, which provides the capability to differentiate ions based on their size, shape, charge and mass mobilities. Thus, it is possible to resolve ions that may be indistinguishable by traditional mass spectrometry. 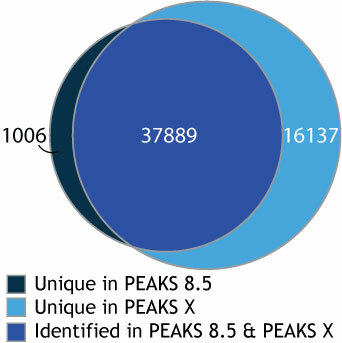 Using PEAKS, the ion mobility data can be viewed in the Mobility-LC-MS 4th-Dimension. The additional dimension enables increased identification sensitivity with smaller sample amounts. 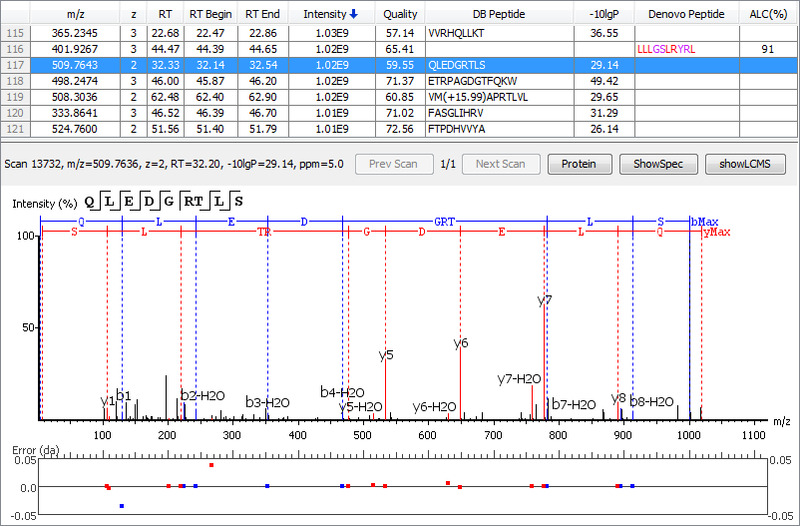 Easy-to-use PEAKS graphical user interface categorizes the raw data into IM-MS, IM-MS/MS, and LC-IM/MS. Researchers can easily view 4-D feature detection and feature separation based on ion-mobility.